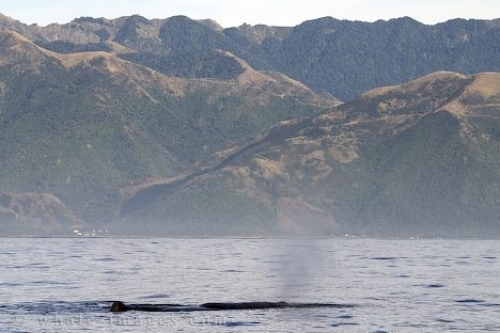 Kaikoura Bay - Sperm Whale, Physeter Macrocephalus, Kaikoura, New Zealand coast. Best known for the plentiful supply of crayfish in the surrounding waters, and the signs that dot the road advertising "fresh cooked crayfish" which can be brought from the roadside caravans. The Kaikoura Bay off the south island of New Zealand is also a place where you can see a variety of marine mammals including dolphins, seals, and whales as well as sea birds namely albatross, penguins, and pelagic ocean birds. Kaikoura bay was first settled by Europeans in 1843. If you like New Zealand you will love those beautiful pictures of New Zealand.